This was the Sheffield band’s largest headline show to date in the UK, and we were asked by our friends at Abbey Road Live Here Now to film this defining moment in Bring Me The Horizon's career. 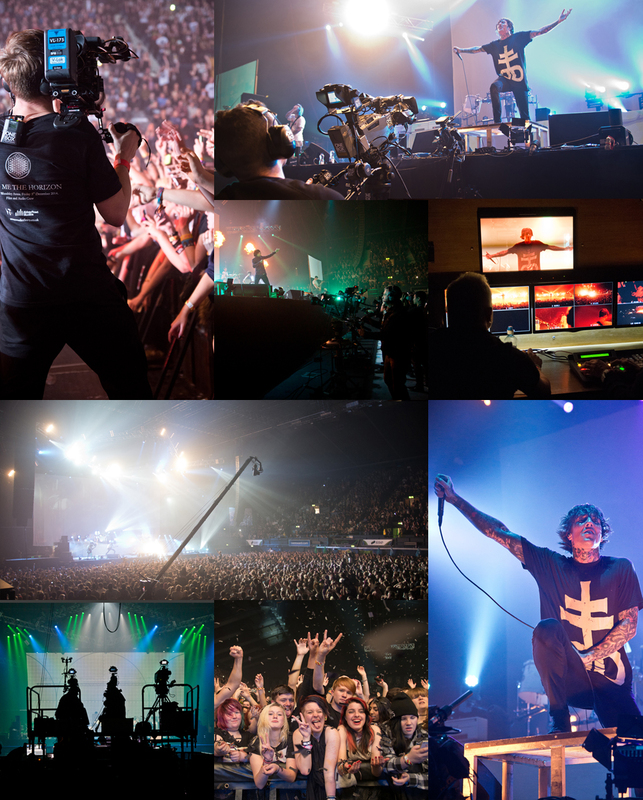 Having spent a large part of 2014 on tour in the US and in the Far East, the Wembley show marked the final performance of the Sempiternal campaign. It was a rousing send off, to mark their return to the studio in 2015. 13 cameras, an OB truck and 14,000 screaming fans. It was loud. And amazing. Early meetings with lead singer Oli Sykes gave us a brief that it should be ‘a concert film, but no normal concert film …’. We immediately had an inkling that this would be a special project to be a part of. We weren’t wrong. Four albums into a career that’s going stratospheric, Bring Me The Horizon are simultaneously anthemic and challenging, melodic and absolutely, totally in-your-face. Despite these extremes there truly is no middle ground. This was a dynamic, energy-fuelled performance, matched only by the crowd’s participation. Toward Infinity were commissioned to co-produce the concert film with Abbey Road Live Here Now, who were producing a live CD of this landmark show. The Live DVD / CD product is slated for release in March 2015. In terms of the production design, we wanted to retain as much of the existing look and feel as possible, and we worked in conjunction with the band’s superb Lighting Director Ben Inskip, to make sure as much of the original show as possible remained unchanged, but we had enough light to create great pictures. With a combination of operated and locked off cameras, we ensured we maximized coverage for the budget we were working within. We put together a dream team of operators, gave them a specific and pretty tight shooting brief, and let them do what they do best; get inspired, and deliver some incredible footage on the night. We also had a backstage crew to film an opener and show closer. This was a lesson in flexibility (as these things often are), not getting in the way but at the same time delivering enough material to create what we needed. They did not disappoint – we knew they wouldn’t! The show was line cut on the night for the arena screens, and to provide a strong basis for the edit. This allowed us to do a quick turnaround, so that by the end of December 2014, the band had a rough cut of the entire show, two weeks after the show had been shot. Throughout January and February 2015 we fine cut the show, interweaving the projection media within the show, and laying down the show sound mix. This is when projects come alive, and become something other. And this one certainly is. We really hope the fans like it as much as we have enjoyed working on it. It’s part of the joy of doing what we do, being able to record extraordinary moments happening. It really feels like this is what we have achieved here.